The grizzly bear (Ursus arctos ssp. ), less commonly known as the silvertip bear, is a large subspecies of brown bear inhabiting North America. Scientists generally do not use the name grizzly bear but call it the North American brown bear. The Ussuri brown bear (U. a. lasiotus) inhabiting Russia, Northern China, and Korea is sometimes referred to as black grizzly although it is a different subspecies from the bears in America. Meriwether Lewis and William Clark named it to be grisley or "", which could have meant "grizzled" (that is, golden and grey tips of the hair) or "fear-inspiring". Nonetheless, after careful study, naturalist George Ord formally classified it in 1815 – not for its hair, but for its character – as Ursus horribilis ("terrifying bear"). Classification has been revised along genetic lines. There are two morphological forms of Ursus arctos, the grizzly and the coastal brown bears, but these morphological forms do not have distinct mtDNA lineages. Brown bears originated in Eurasia and traveled to North America approximately 50,000 years ago, spreading into the contiguous United States about 13,000 years ago. In the 19th century, the grizzly was classified as 86 distinct species. However, by 1928 only seven grizzlies remained and by 1953 only one species remained globally. However, modern genetic testing reveals the grizzly to be a subspecies of the brown bear (Ursus arctos). Rausch found that North America has but one species of grizzly. 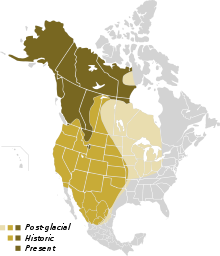 Therefore, everywhere it is the "brown bear"; in North America, it is the "grizzly", but these are all the same species, Ursus arctos.